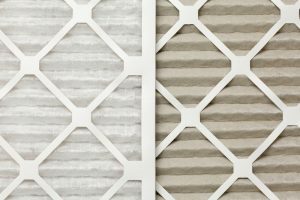 Furnace Filters and Air Quality Filters: There’s a Difference! Protecting and improving the quality of the air inside your home is an important part of comfort and health. It’s almost as important as caring for the furnace keeping you warm in winter. But often people assume their homes have a decent defense against unwanted particles circulating through the ventilation system because they have a furnace filter. But this is a misunderstanding about what the furnace filter (or filter for another forced-air system, such as a heat pump) actually does. If your home is suffering from low indoor air quality that’s making your winter unpleasant, you’ll need different types of filters or other IAQ products. No, the furnace filter is not in place to improve the quality of your air. It may have a minor effect on it, but cleaner air isn’t its purpose. The reason there’s a filter in place on the cabinet of the furnace is to protect the furnace and the other components inside the HVAC cabinet, which also includes a blower fan and (in many cases) the air conditioner’s evaporator coil. As the fan draws air through the return vents of the home, plenty of dust and lint and other debris comes with it. The filter’s mesh stops these particles from entering the cabinet, where they can quickly impair the workings of motors and interfere with the evaporator coil. This filter may not clean the air, but it needs regular attention throughout the season. It will eventually become clogged with debris and need to be changed for a fresh one (this takes from 1 to 3 months on average). If the filter is left in place, it puts extra strain on the furnace that will spike bills and lead to a drop in airflow through the system. For homes requiring additional IAQ help due to smaller particles slipping through the air filters, special electronic air purifiers can be paired with the filters. These purifiers target tiny pollutants such as volatile organic compounds, chemicals, smoke, and even viruses and bacteria. Speak to an IAQ specialist to find out the best way to defend your household from irritants and unhealthy contaminants. We offer the finest work when it comes to both indoor air quality and heating service in Garfield, NJ and throughout the Tri-State Area. If your furnace isn’t doing the job you need from it, we’ll take care of the repairs. (And if you haven’t scheduled your fall maintenance yet, give us a call today to schedule it.) Our IAQ professionals work with all types of air filtration and purification systems, including powerful UV germicidal lights that wipe out viruses and germs—they work much like the air purifiers that hospitals use. Need help with your heating, indoor air quality, or both? Schedule with Advanced Mechanical Services anywhere in the Tri-State Area.